1.1. One of the strengths of radio imaging is that it provides unequalled spatial resolution when Earth-sized baselines are used. As shown in the following figure, an expanding supernova remnant in another galaxy (M81) is now being tracked with VLBA observations. Assuming that the transverse expansion velocity is the same as the typical blueshift velocity for supernovae, 10,000 km/s, how far away is the supernova? The supernova began on 1993 March 28, and the angular diameter of the image on 7 Dec 1998 is about 7 mas (milli-arcseconds) (see a paper on the subject for more information if you wish). Does your answer agree with the value quoted in the figure caption? Minimum credit line: Image courtesy of NRAO/AUI and N. Bartel, M. Bietenholz, M. Rupen, et al. SN 1993J was discovered March 28, 1993, by Francisco Garcia Diaz, an amateur astronomer in Lugo, Spain, using a 10-inch Newtonian telescope. Located in M81, a spiral galaxy in the constellation Ursa Major, the distance of this supernova from Earth is estimated to be 11 million light-years. Its proximity and its radio brightness have offered a unique opportunity for very long baseline interferometry studies. Using radio antennas in the Very Long Baseline Array, the Very large Array, and various tracking stations around the world, astronomers have been able to study the structure of the supernova in detail. 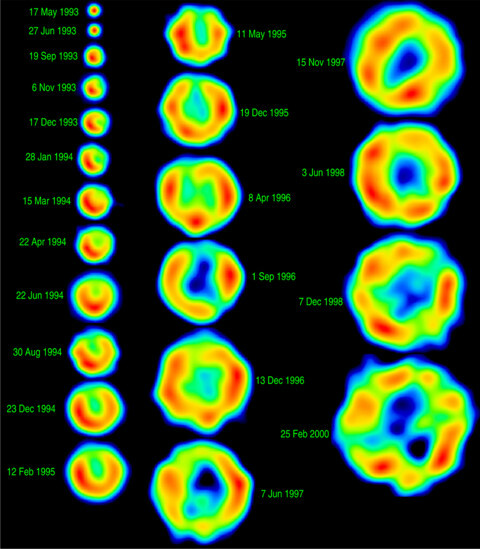 By observing at regular intervals, they have produced this sequence of images showing a shell-like radio structure that has expanded for seven years with circular symmetry. Investigator(s): N. Bartel, M. F. Bietenholz, M. P. Rupen, et al. 1.2. For a circular source of diameter 10", and constant brightness temperature Tb = 107 K, what is the total flux density measured by a small radio dish at 5 GHz? 10 GHz? Note: assume that the beam (field of view) of the dish is much larger than the source. 1.3. For the quiet Sun, Tb (10 GHz) ~ 11,000 K. Determine the total flux density from the Sun at this frequency if the disk is featureless. 1.4. What is the FWHM of the primary beam of the OVSO 27-m antennas? Express your answer in arcmin. What is the total flux density, in sfu, measured at the center of the quiet Sun at 10 GHz with a 27-m dish (use the quiet Sun brightness from problem 1.3). 1.5. Perform the steps listed in the bullets below equation 2 of the lecture to derive the Wien displacement law, Rayleigh-Jeans law, Wien law, and Stefan-Boltzmann law. The frequency form and wavelength form of the Planck function (equations 1 and 2 of the lecture) are different by what factor? Where does this factor come from?